How to grow mosses successfully in Aquariums? I am growing mosses till 2008. First time I got java moss. After that I sourced more varieties of mosses from different parts of country. I have learnt many facts in the way to growing mosses successfully in the extreme temperature of Delhi. In summers, temperature of North India touches 44 to 46 degree Celsius. 1. Cool Temperature: Cool Temperature is must to grow mosses in aquarium. It is must to maintain maximum temperature around 25 degree celcius. In dry places such as Delhi, fans are good option to reduce temperature through the process of vaporization. 2. Clean Water: All of the moss loves to grow in clean water. Dirt in water causes deposit of debris over moss. Frequent water change and less bioload help to maintain clean water. 3. Light, Nutrients and CO2: Every plant needs proper lighting, nutrients and CO2 for growth. Most of the Mosses can do well in low light and with or without nutrients and CO2. Mosses are best for low tech setups. 4. Attaching moss with rough surfaces: Attached moss grows rapidly in comparison of free floating moss. Always tie moss with rough surfaces of rocks, woods etc with the help of thread or fishline. Over time, moss attaches themselves with the surface. 5. Regular Pruning: Regular pruning of mosses increases the growth of mosses. Without regular pruning, under side mosses will turn brown. 6. Algae infestation: Algae is always causes a slow death for the beauty of mosses. Always keep away algae from mosses for real show up. Below mentioned points will help in killing algae. a. Regular water change helps in controlling algae. b.	Hungry Rosy Barbs are very helpful to remove algae. c.	Toothbrush can also use to remove algae from mosses. d.	Complete darkness for 4-5 days kills algae completely. 1. Don’t introduce any moss eating fish in the tank. a. Remove all the moss from the tank. b.	Wash it carefully 3-4 times to remove any dirt. c.	Now put this moss in airtight box. d.	Store this box in fridge. e.	When you want to reuse this moss, put the box in a bucket. Also put some ice cubes over the box. Now take some normal temperature water in another bucket. Release normal water over the box the through a Glucose bottle pipe. The temperature of mosses should normal slowly-slowly. After normalization of moss temperature, it is ready to put in the aquarium. I have successfully followed above mentioned method with christmass moss in June 2011, when I was out of station for 8 days. 1. Mosses don’t need any substrate. 3. Provides hiding places to fry and shy fish. Hope this will be helpful in the way to grow mosses successfully. Any advice, comments and queries will be appreciated. 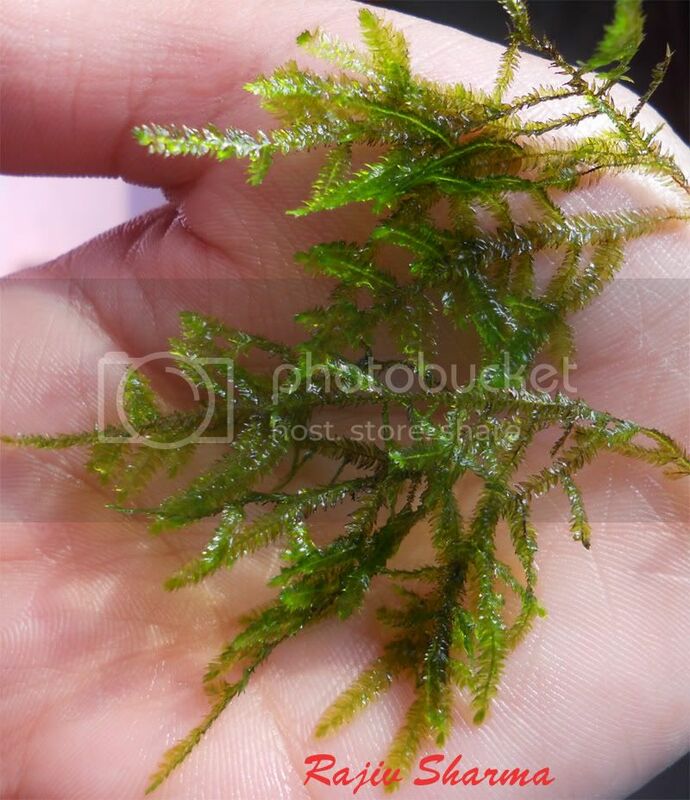 Re: How to grow mosses successfully in Aquariums? Rajiv has grown from strenght to strenght in the last 5 years in growing moss. This thread is proof of it, and can be really useful for aspiring moss-growers in a place as hot and extreme as Delhi. 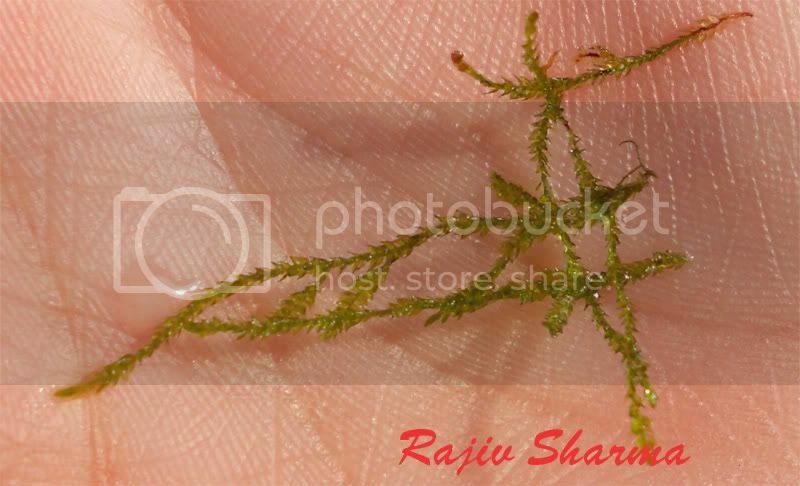 Guys, please show here the photographs of the mosses you have for the identification purpose. I adding some of the photographs of mosses. I once kept java moss in the fridge like you have written. It was close to the light bulb of the fridge but that remained on only a few moments a day. I would check on it once a week by opening the cap for an hour or so. It survived 5 months! That is until the maid threw it out when cleaning the fridge. "Saab ji to pagal ho gaye. Kachra hi to pheka bahar mainay" : The boss has gone crazy. I just threw out the rubbish.